Make yourself at home in one of the 55 air-conditioned rooms featuring refrigerators. Rooms have private balconies. Complimentary wireless Internet access is available to keep you connected. Bathrooms have showers and hair dryers. Grab a bite at Palladion Restaurant, a beachfront restaurant which features a bar, or stay in and take advantage of the room service (during limited hours). Buffet breakfasts are available daily from 7 AM to 10 AM for a fee. For lunch or dinner, stop by Marea Restaurant, a restaurant that specializes in Mediterranean cuisine. Dining is also available at the coffee shop/café, and room service (during limited hours) is provided. Wrap up your day with a drink at the bar/lounge. A complimentary buffet breakfast is served daily from 7 AM to 10 AM. When you stay at Almira Mare in Chalcis, you'll be near the beach and 8 minutes by car from Fortress of Karababa. This 4-star hotel is 2.5 mi (4 km) from Asteria Beach and 2.9 mi (4.7 km) from Athanaton Square. Take advantage of recreation opportunities such as an outdoor pool or take in the view from a rooftop terrace and a garden. Additional amenities at this Mediterranean villa include complimentary wireless Internet access, concierge services, and babysitting/childcare (surcharge). Getting to nearby attractions is a breeze with the area shuttle (surcharge) that operates within 86 km. 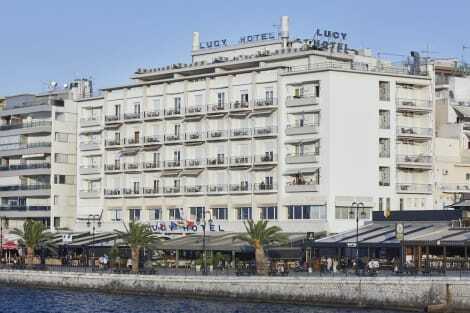 lastminute.com has a fantastic range of hotels in Chalkis, with everything from cheap hotels to luxurious five star accommodation available. We like to live up to our last minute name so remember you can book any one of our excellent Chalkis hotels up until midnight and stay the same night.